This day and age it is becoming more and more widespread for brides to be involved in the choosing of her engagement ring. Even if you got yours and is very happy with it, this article presents some good-to-knows about your wedding jewellery. Whether you are buying an engagement ring or a wedding band, there are some things to consider before you hit the jewellery shops. Your engagement ring is likely to be the most important jewellery that you will ever own. It is an investment for life, just like your marriage, and should therefore reflect your unique style and personality. Find something that you will absolutely love to wear on your wedding day and treasure everyday throughout your life. It is good to familiarize yourself with the four C’s of a diamond: Cut, Clarity, Carat and Colour. The variations of these will determine the cost and the appearance of the stone. Ask the jeweller to explain this chart of the C variables, and you can get an understanding of the quality you are buying. Diamonds are expensive, as you will see! But gold and diamonds are also an investment for the future and will never loose their value. Consider other gems, such as sapphire, ruby, topaz, amethyst, emerald or rose quartz in your ring. They could even replace diamonds as the main stone, and have a row of cluster diamonds around it for extra sparkle. Colourful engagement rings are fashionable and individual. More and more brides opt for ethically sourced stones and lab grown stones such as moissanites, which are less heavy on resources (water, oil, mining) to produce. 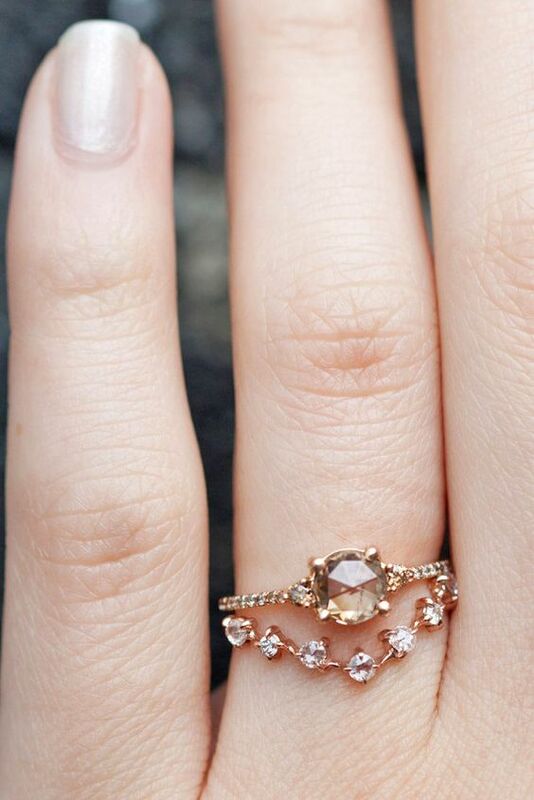 Wearing a family heirloom can also be a nice way of personalizing your ring. If the shape is not suitable for your style, you can have the ring redesigned and the stones re-set. Just make sure the previous owner is okay with that. You can of course do the same if you sometime in the future want to modernize your ring, in the unlikely event you would like to update its appearance. Have your bands engraved for a special touch. You could even surprise your partner with this on the day. Select a wedding band which is striking enough to wear on its own, without the engagement ring. An eternity band with stones around the top of the band will give you much joy throughout your life. Don’t flash your rings in public places, unfortunately crimes do happen. I often turn my stone around to the inside if I’m out and about – call me paranoid but one can’t be careful enough in a country like ours (South Africa). A jewellery item such as earrings, necklace or a bracelet would be a very thoughtful gift for your bridesmaids, mother and mother in law. They are sure to treasure it forever. Don’t forget to fit the length of your necklace to fit with your wedding dress neckline so that they complement each other. If you have an open back dress design, consider wearing a back necklace with a back drop pendant too. To always have a ring that sparkles, clean it often to remove oils and grime that accumulates. A soft brush and some washing up liquid in warm water in a bowl works well – but to take care to never wash it over an open drain! Once every so often you can take your ring in to the jeweller to have it deep-cleaned for you. Treat your ring well. If you take it off, always put it in the same place, hidden away. Don’t wear it if you are doing housework or creative projects where dirt and chemicals are involved. Consider wearing a “spoof” ring if you go away on holiday, do exercise or house renovation. Every time you look at it and see it sparkle, think about the day you got engaged, the happiness and excitement you are sharing with your husband-to-be and the wonderful life you are creating together, which is to last for the rest of your lives. Previous Free Awesome Hipster Wedding Fonts!